In the eastern Congo, it is difficult to keep up with the plethora of armed groups and their continuing recombinations, reincarnations, and conversions. Over the past two decades of conflict in the eastern Congo, the military landscape has changed dramatically. One group, however, has persisted throughout all of these permutations, and still sits firmly at the nexus of violence in the region: the Forces démocratiques pour la liberation du Rwanda (FDLR) and their stubborn capacity to resist final dismantling. This is not to say that this Rwandan armed group has not, since the 1994 Genocide that brought its predecessors into the Kivus, gone through many changes. It has. Many of the recent ups and downs have been determined by its tumultuous relationship with the Congolese government, which has partnered with the FDLR against the CNDP (2006-2008) and against the M23 (2012-2013) but has also launched repeated offensives against the group during the Umoja Wetu-Amani Leo (2009-2011) and Sukola II (2015-present) offensives. In addition, and often more challenging, have been attacks by local self-defence groups like the Raia Mutomboki, NDC-Guidon, and the UPDI militia. Despite these offensives, the FDLR have persisted. There are probably between 2000 and 2500 FDLR combatants, making it by far the largest non-state armed group in the region. Thanks to its ‘logistique non-conventionnelle’–its decentralized system of extorting ‘taxes’ from peasants and businessmen–the FDLR has reinvented itself as mineral entrepreneurs, cannabis farmers, hinterland retailers, or charcoal traders. But the FDLR is more than just a brutal tax agent; they often work in mafia-like (and sometimes rather peaceful) partnership with local populations, FARDC soldiers, and businesspersons, which is why many stakeholders do not necessary endorse military operations against the group. The ongoing Sukola II operations are a good example of how difficult it will be to uproot the armed group. Around August last year, this latest army offensive gained traction in the forests linking Masisi, Walikale, and Rutshuru territories in North Kivu. Deploying several regiments, the FARDC struggled considerably in advancing towards the FDLR’s strongholds for the first few months. A first attempt to take FDLR’s former HQ on a hill called Rushihe failed in October 2015 and roving, small FDLR units were able to inflict significant losses to the army in a series of ambushes and attacks. It was only in December 2015 that the FARDC offensive managed to conquer Rushihe, Mumo, Katobo, Buleusa and other key positions. These were important defeats for the FDLR, who were forced from central command positions that they had been occupying for several years, and who presumably lost a substantial amount of weapons and ammunition. However, the group’s command structure remains intact around Sylvestre Mudacumura (aka Bernard Mupenzi), its military leader, and Victor Byiringiro (aka Gaston Iyamuremye), its acting president. Indeed, the military offensive may actually have helped attenuate some of the virulent internal struggles opposing Mudacumura, Byiringiro, and other senior leaders. It is important to note that these operations, in contrast to those against the M23 in 2013, were carried out without support by MONUSCO, as joint operations had been put on hold since early 2015 in a row over the involvement of two Congolese generals accused of abuse. According to multiple sources on the ground, the FARDC success could be attributed in large measure to their collaboration with two local militias, as well as efforts by General Bruno Mandevu (one of the UN-blacklisted FARDC officers) to reshuffle commanders in order to diminish FARDC-FDLR collusion. With support through FARDC networks, the NDC-Rénové of Guidon Shimiray, a former deputy of Sheka Ntabo Ntaberi, became the de facto ‘western wing’ of the anti-FDLR operations pushing the FDLR and their dependents northwards into the southern part of Lubero territory. While it effectively limited the FDLR’s room for manoeuvre––the group has for long been known for being extremely versatile in its movement––this strategy has, however, opened another Pandora’s box in the complex Kivutien ethno-political balance. As the FDLR moved northward, the fragile coexistence of Hutu and Nande populations in that area was disrupted up by an influx of Rwandan and Congolese Hutu. Amidst increasing tension over land and livelihood, a mysterious local militia emerged, coalescing loosely around the Kyaghanda Yira, an ethnic cooperative. An indication of the complexity of these relations: Its leader Marungu is a local customary chief from Buleusa who was reportedly angered by the by local FDLR commander Kizito, who had taken to chopping down trees on his property to profit from the lucrative timber trade in the region. Marungu then joined the FARDC/NDC-Rénové alliance under the label of Union des Patriotes pour la Défense des Innocents (UPDI). Locally, the UPDI is also known as Mai–Mai Mazembe. Since early January, they have engaged in a series of attacks against the FDLR and killings of Hutu civilians, in parts sparked by the Miriki carnage against local Nande that received wide media coverage. Despite this, the FDLR appear to – once more – be making the most out of their misfortune. 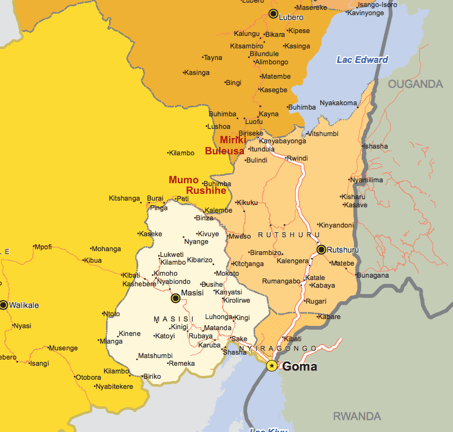 Around Miriki and Luofu, reports indicate that the RUD-Urunana (an earlier split-off of FDLR) and local Congolese Hutu militia are fighting back against the UPDI and NDC-Rénové, and that at the southern ends of the FDLR’s area of influence there is renewed mobilisation of Nyatura, an array of Congolese Hutu militia based in Masisi and Rutshuru, in particular the FPC led by Domi. This violence is underwritten by the larger communal conflict ravaging Masisi, where Congolese and Rwandan Hutu often engage in alliances that result in the embedding of FDLR combatants in Nyatura factions. Ironically, the more FDLR is trapped in a corner, the more it seeks to seed confusion and tension, deflecting attention by igniting other trouble spots. All of this supports several conclusions: It is patently difficult to mount a successful military operation against the Rwandan rebels that have become deeply embedded in Congolese soil and society. Both FARDC’s own limitations––especially the lack of available units and the subsequent exhaustion of soldiers––and the tough logistic environment in which Sukola II has been taking place have further complicated an already thorny situation. In addition, Miriki marks the border between Sukola II and Sukola I’s areas of responsibility, making coordination between regiments another obstacle. However, on the other side it is the absence of a more comprehensive strategy to complement military pressure that darkens the fate of any efforts to dismantle the FDLR. Nested in this political environment of myriad unsolved crises, such as the tensions between the Hutu and Nande communities, the FDLR has nimbly deflected any challenges to its own existence to escalate broader conflict dynamics in the region, from which it ends of benefiting. Written off many times, today’s weakened FDLR may well just beginning a new, brutal lease on life.